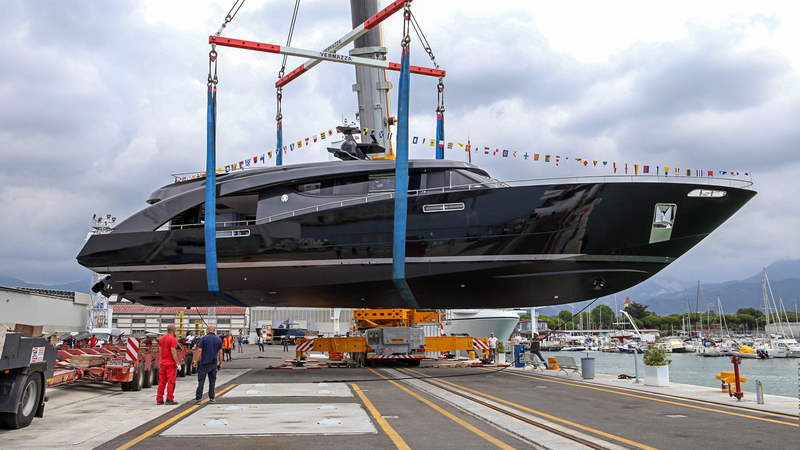 Freedom, a 27-metre custom yacht commissioned by the Italian fashion designer Roberto Cavalli, who personally designed her in cooperation with his friend and designer Tommaso Spadolini, was launched at CCN’s facilities in Carrara, Italy. Freedom, part of CCN Fuoriserie line, will have her official debut at this year’s Monaco Yacht Show in September. Freedom is a 27-metre high-performance motor yacht featuring an aluminium hull and superstructure. Powered by no less than 3 water-jet engines, she is capable of a maximum speed of 40 knots. Both the exterior profile and the interior layout were conceived to reflect the personality of the renowned owner, whose brief was for a yacht enhancing maximum contact with the sea while also ensuring the utmost privacy. The master cabin – located behind the helm station – will extend across the entire main deck. A central sky-light will let in plenty of natural light, while, aft, the large cockpit fitted with concealing curtains will allow to fully enjoy the sea in privacy. The lower deck will feature 2 guest cabins and comfortable crew quarters, and the fly will include a private area with pilot seat. The tender will be located forward. “Designing and building this yacht has been a real ‘challenge of style against style.’ The creativity and passion found in Freedom is the best possible mix and I can only thank the man who, with his visions, signed the future of elegance and taste,” said CCN’s CEO Diego Deprati.